Breeding season for many North American minnows belonging to the family Cyprinidae is marked by drastic changes in the appearance of the males. As spring approaches and water temperature warms, males of many species begin to display vibrant colors to attract mates. Many of these fish live in clean, clear water where bright colors can be effective at communicating with potential mates. In addition to changes in color and behavior, in minnow species the males begin to grow temporary bumps over their heads (and bodies and fins of some species). The exact function of the bumps, sometimes called nuptial tubercles, is not fully understood, but it is believed they are used for nest defense and for stimulation of their mate. Males of the minnow genus Nocomis, commonly referred to as chubs or horny heads, use nest building with stones to impress their mates. 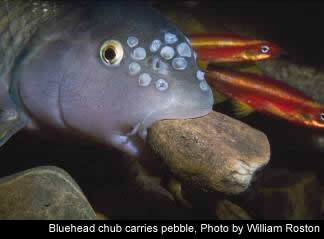 Minnows of this genus are nest builders- constructing nests made first by excavating a pit in the substrate. Once the pit is dug a male will coax a female to enter the pit where mating occurs. Once the eggs have been released and fertilized the male then fills the pit with larger river stones protecting the fertilized eggs from predators and from being smothered by silt. These larger stones provide more space so clean, oxygen rich water can flow over the nest. The male then aggressively guards the nest from other fish who may attempt to prey on the eggs.